Remember my good friend who didn’t have any special dietary needs but decided to put herself on a low-sodium diet for the month of January, just to put herself in my shoes for a little while and experience a whole new world of flavor makers? Well one thing you didn’t know was that when that friend decided to cut out salt and processed foods and embark on this routine shifting, meal changing experiment, she also started another life-altering adventure at the same time. She started dating a new dude. Just as she was getting to know a new guy, she dropped a big bomb. She was on a low-sodium diet. Just for the month of January. But that meant that, suddenly, dinners out and meals made at home were no longer as simple as making reservations or picking up pizza. It required more forethought and thoughtfulness and creativity. Which, even though it sounds like a dating nightmare, are actually all of the ingredients you need for a spicy relationship. Right? Well it turns out that when my amazing friend told her amazing new boy about this dietary challenge, he didn’t run in the other direction. He hopped on this site. Turned on the charm. And surprised her with a low-sodium version of his favorite breakfast: eggs in a hole (which is a fried egg cooked right inside some butter-browned toast, aka heaven). And by joining her in the challenges (as well as successes) of the diet, he didn’t just impress her, he proved himself an awesome partner too. Able to make the most out of roadblocks. And able to cook breakfast as well. So this Valentine’s Day, let me remind you to share your diet with others. Loved ones, friends, coworkers, and even new dates. Maybe some people will get scared off. But I bet you that the people in your life will be more likely to want to join along. Make it fun. Make it work. 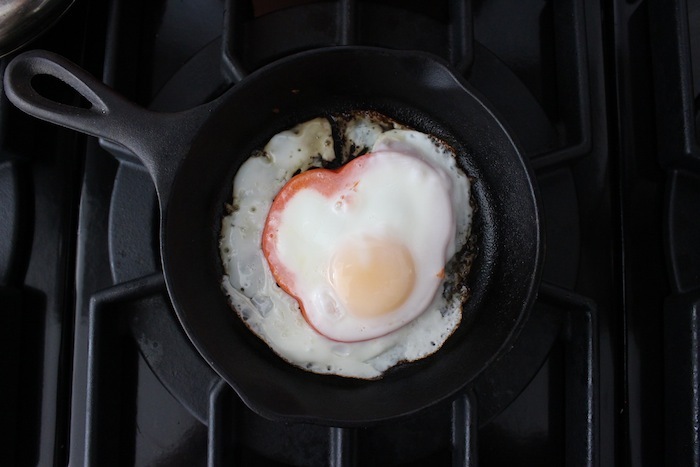 And make these Eggs in a Heart (my super low-sodium, gluten-free, low-potassium version of the old classic). Which is all to say this: let your loved ones show you some love. Because that is the ultimate ingredient in a wonderful low-sodium life. And for more tips on dating with a special diet (and my first meal with my husband, hubba hubba), check out my blog post on the National Kidney Foundation website. 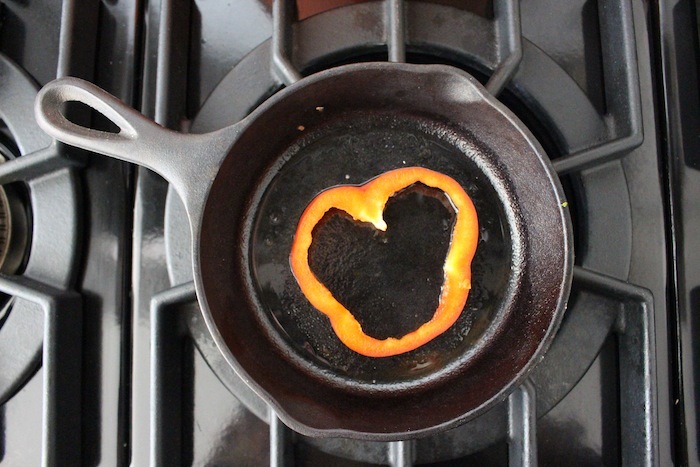 Heat vegetable oil in a medium-sized pan (that can be covered with a lid). When the oil is hot and ready, add the two slices of red pepper in a single layer and cook for 5 minutes, until they soften a bit. 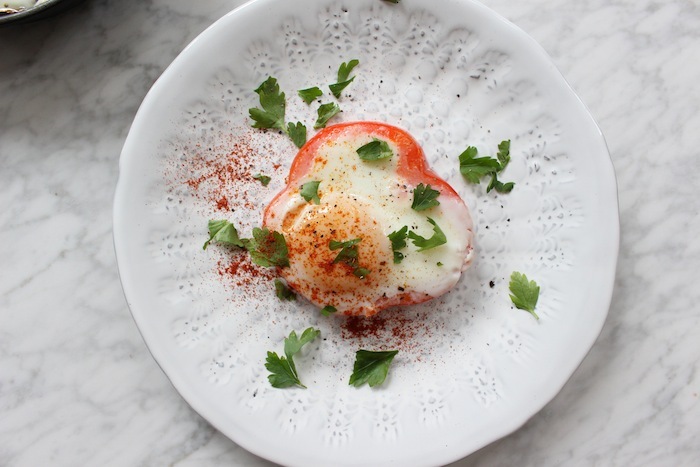 Then add an egg to the inside of the red pepper slices. Note: egg white will spill out beyond the pepper line. Place the lid over the pan and cook until the egg whites inside the pepper set, about 10 to 12 minutes. 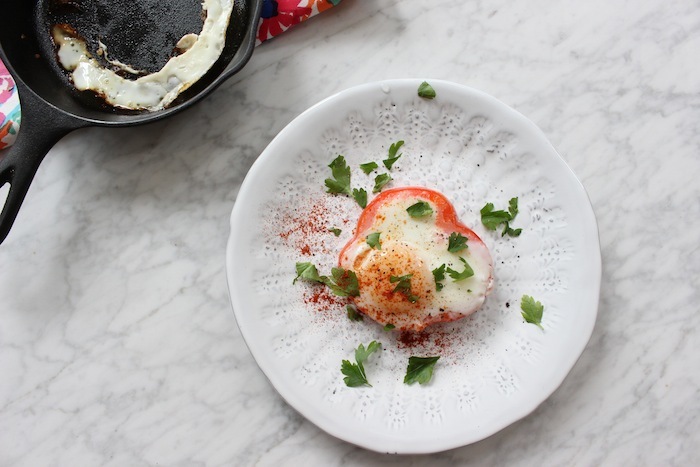 To serve, use a knife to gently remove extra egg white from the outside of the pepper (save these crispy egg white bits for snacking). 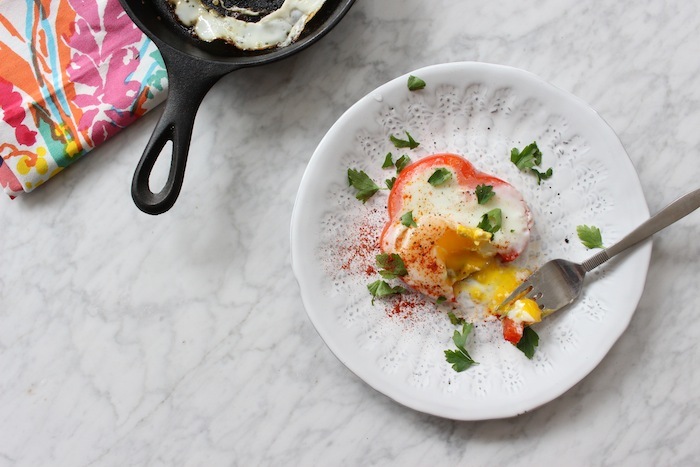 Spatula the egg-filled pepper to two plates. Sprinkle on some smoked paprika, pepper, and fresh herbs. Dig in. I love this idea. Thank you! I’m also on a very low sodium diet. One of my staples has become Alvarado Street Bakery’s No-Salt bread. It’s made from ground sprouted grains and weighs in at 10 mg of sodium per slice. It would be another good choice for a toad-in-the-hole substitute. 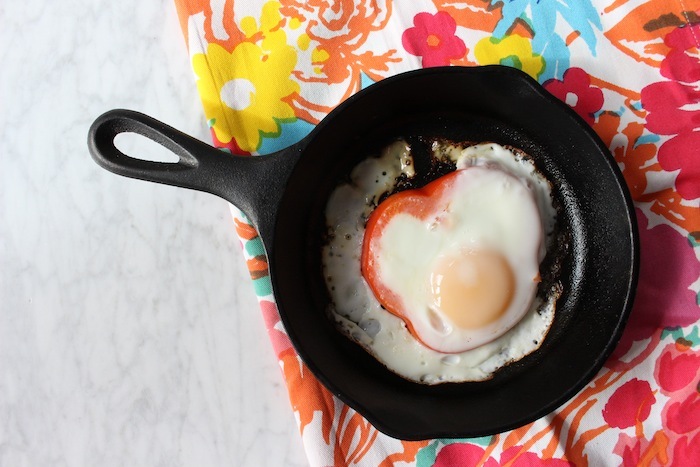 I’m most definitely trying these eggs in a heart, though–can’t wait! Toad in the hole is actually a British recipe and is sausages cooked in Yorkshire pudding, so i have never heard of your version. I enjoy reading your recipes so thanks for helping us out with low sodium ideas. If only we could persuade food manufacturers and chefs to be more imaginative with how to season.